Reptiles are animals whose bodies are covered with scales. The scales aid in water conservation and general body protection against injuries. However, reptile skin is vulnerable to fungal infections, which may spread to other organs in the reptile's body. Commonly affected organs include the respiratory tract, kidneys, spleen, intestines and stomach. 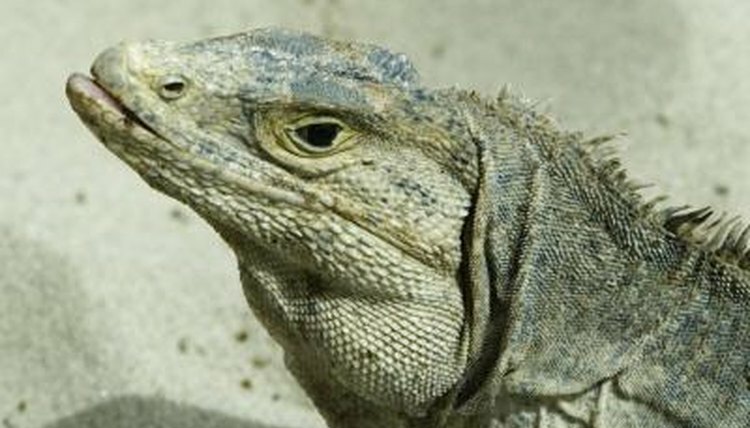 Fungal infections in reptiles can easily be identified and treated. Signs and symptoms include loss of weight and appetite, subtle blisters on the scales, growths in scales and discoloration of the skin. A veterinarian may diagnose fungal infection on the reptile's skin by physical examination or even the history of the animal. A blood test could also determine whether the infection has spread to affect internal organs. Fungal skin infections on reptiles occur mostly due to poor conditions of their habitats. Dirty and humid habitats encourage the growth of fungi. Moreover, most reptiles spend most of their time in water, where the temperature is low and the environment is moist. This causes fungal proliferation, which thrives on the reptile's skin. Fungal infections weaken the immunity of the animal. The situation worsens if the animal is malnourished. Its body grows weak, giving way to other infections to attack the animal. If the animal suffers a cut on its body, the infections may spread to other internal organs and cause more serious infections. Subtle infections on the reptile's skin and shell can be treated using a topical antibiotic ointment. First the affected part is gently cleaned using diluted povidone-iodine or a solution of chlorhexidine. Then the antibiotic is applied on the affected part twice daily. Sometimes the fungal infection is characterized by a septic wound, but the reptile's condition is still good. An antifungal cream can be used to treat it. However, the animal's condition may continue to deteriorate and the wound may not show signs of healing. This calls for immediate veterinarian attention. Always consult an experienced reptile veterinarian regarding the health and treatment of your pet. If your reptile is recovering from a fungal infection, carefully house him in a low-humidity area with a clean environment. Inspect the area for objects that can cause skin injury and remove them. Proper nourishment is paramount in nursing your reptile pet back to health. Washington State University: What is a Healthy Reptile? Kendal Elizabeth has been a professional writer and editor since 2001. She has specialized in writing pet-related topics, home decor and gardening. Her work has appeared on several online and offline publication. Elizabeth holds a Bachelor of Science in Animal Science with a minor in marine biology from Cornell University. Can You Get Ringworm From a Guinea Pig? Is Holy Basil Good for Dogs? Is Ringworm Caused by Raccoon Urine?